Sellr sends congratulations to the Alabama Crimson Tide for their National College Championship win. The National College Championship was exciting! It really did come down to the wire with the game going into overtime. While fans were groaning about the late hour of the game, the coaching staff was forced to switch up their strategy. As the coach of your marketing, are you able to switch up your marketing game on a play-by-play basis? Hadn’t Thought About it That Way! Retail changes rapidly. New products arrive, other products come out of production, you have new promotions, or at least changes to your promotions, even simple ones like the date of expiration. Digital marketing is the efficient way to make the quick change ups to your marketing game. By creating a digital campaign, you can distribute your message across any connected screen. Most print campaigns these days start with digitally created content. If you’ve only ever used signs and banners, consider asking about the digital files for distribution on in-store screens. Traditional print marketing is a lot like a middle school football team--it has game but it’s made up of a few go-to plays. In the same vein, print ads are limited by cost and space forcing you to rely on a limited number of the same promotions. Digital content allows you to run as many ads as you want in the same amount of space and with a limited ad creation effort. We don’t recommend running so many ads that your shoppers are overwhelmed but the ability to customize ad plays per screen lets you pick and choose where ads are served letting you drill down to the right message in the right place. Digital marketing allows you to reflect these changes quickly. The Sellr Marketing Dashboard lets you make these changes using an app or your computer within minutes for immediate distribution. Centralized editing lets one person make changes instead of employing your whole team to find print ads and manually change them, disrupting their workflow. We can’t finish this blog without talking about the engagement digital signs offer. Like football, your shoppers will be watching your in-store screens to see what comes next. Overhead digital signs can be the “pregame” show, letting shoppers know about your promotions at a high level and where to find them in the store. Once shoppers arrive in the aisle, interactive tablets offer more in-depth coverage--the actual game. Sellr Tablets let shoppers scan a product’s barcode to learn about its “team”--product notes, origins, and for products in our Content Library, recipes that can be emailed or texted to the customer. This ability to interact with your promotional content is proven to increase sales and it allows you to gather shopper data for direct marketing such as emails or social media ads. 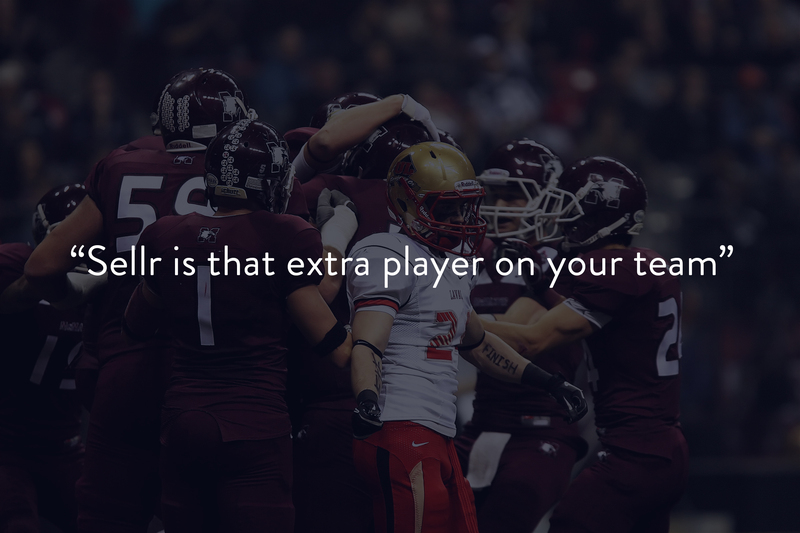 Print banner ads and shelf signs are quickly becoming the equivalent of leather football helmets. Digital ads provide more coverage and offer more versatility. By using digital marketing assets, you create once and distribute multiple times, changing up your product promotion and making it more exciting to your shopper. Let Sellr be the new member of your (marketing) team. We don’t even require a contract.